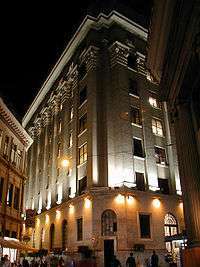 The BM&F BOVESPA (Portuguese pronunciation: [boˈvespɐ]; in full, Bolsa de Valores, Mercadorias & Futuros de São Paulo) is a stock exchange located at São Paulo, Brazil. At the end of 2011 it had a market capitalization of US $1.22 Trillion, making it the 13th largest stock exchange in the world. However, owing the slump in economic growth in Brazil associated with political problems, in addition to the strengthening of the U.S. Dollar vis-à-vis the Brazilian Real, the capitalization shrank to R$2.21 trillion by the end of 2015, or around US$1,630 trillion. On May 8, 2008, the São Paulo Stock Exchange (Bovespa) and the Brazilian Mercantile and Futures Exchange (BM&F) merged, creating BM&FBOVESPA. The benchmark indicator of BM&FBOVESPA is the Índice Bovespa. There were 381 companies traded at Bovespa as of April 30, 2008. On May 20, 2008 the Ibovespa index reached its 10th consecutive record mark closing at 73,516 points, with a traded volume of USD 4.2 billion or R$ 7.4 billion, and on August 17, 2011 the Ibovespa made its biggest traded volume in its history, with a volume of USD 14.8 billion or R$ 23.7 billion. BM&FBOVESPA also has offices in New York City, Shanghai, and London. Founded on August 23, 1890 by Emilio Rangel Pestana, the "Bolsa de Valores de São Paulo" (São Paulo Stock Exchange, in English) has had a long history of services provided to the stock market and the Brazilian economy. Until the mid-1960s, Bovespa and the other Brazilian stock markets were state-owned companies, tied with the Secretary of Finances of the states they belonged to, and brokers were appointed by the government. 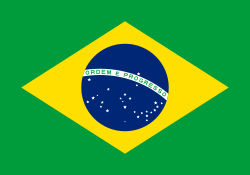 After the reforms of the national financial system and the stock market implemented in 1965/1966, Brazilian stock markets assumed a more institutional role. In 2007, the Exchange demutualized and became a for-profit company. Through self-regulation, Bovespa operates under the supervision of the Comissão de Valores Mobiliários (CVM), analogous to the American SEC. Since the 1960s, it has constantly evolved with the help of technology such as the introduction of computer-based systems, mobile phones and the internet. In 1972, Bovespa was the first Brazilian stock market to implement an automated system for the dissemination of information online and in real-time, through an ample network of computer terminals. At the end of the 1970s, Bovespa also introduced a telephone trading system in Brazil; the "Sistema Privado de Operações por Telefone" or "SPOT" (Private System of Telephone Trading, in English). At the same time, Bovespa developed a system of fungible safekeeping and online services for brokerage firms. In 1990, the negotiations through the Sistema de Negociação Electrônica - CATS (Computer Assisted Trading System) was simultaneously operated with the traditional system of "Pregão Viva Voz" (open outcry). Currently, BM&FBOVESPA is a fully electronic exchange. In 1997, a new system of electronic trading, known as the Mega Bolsa, was implemented successfully. The Mega Bolsa extends the potential volume of processing of information and allows the Exchange to increase its overall volume of activities. With the goal to increase popular access to the stock markets, Bovespa introduced in 1999 the "Home Broker", an internet-based trading systems that allows individual investors to trade stocks. The system enables users to execute buy and sell orders online. In 2000, Bovespa created three new listing segments, the Novo Mercado (New Market), Level 2 and Level 1 of Corporate Governance Standards, allowing companies to accede voluntarily to more demanding disclosure, governance and compliance obligations. The new listing segments mostly languished until 2004, when a growing number of newly public companies began to list on the Novo Mercado and other segments as part of a capital-raising effort. From 2004 to 2010, the vast majority of new listings on the Bovespa were made by Novo Mercado, Level 2 and Level 1 companies. The Novo Mercado, Level 2 and Level 1 segments are based on a contractual agreement of the listed company, its controlling shareholder, and its management to comply with specified regulations. In addition, listed companies must submit to arbitration as a method of resolving disputes. The set of protections entailed by a Novo Mercado listing is apparently deemed by market participants to increase the attractiveness of companies. The stock market index of Novo Mercado listed companies (the IGC) has consistently outperformed the broader Ibovespa index since its launch. The recent success of the Brazilian equity capital markets is attributed to a significant extent to the credibility engendered by the Novo Mercado regulations. In 2007, only the United States and China equity markets had a greater number of initial public offerings. The availabiltity of a "market exit" has also encouraged the development of a private equity industry, a growing Brazilian investment banking market and a thriving asset management industry. Another side benefit of a thriving equity market has been access to equity financing for the international expansion of Brazilian business. Brazilian multinational companies have used the proceeds of equity offerings to fund a growing number of international acquisitions. Vale, Embraer, Gerdau, Brazil Foods, Marfrig Alimentos and JBS have acquired businesses outside Brazil using the proceeds from equity offerings. Attractive valuations of Brazilian subsidiaries have led international companies to list their Brazilian subsidiaries, as was the case of Banco Santander Brasil. On May 8, 2008, Bovespa Holding announced the merger of the São Paulo Stock Exchange (Bovespa) and the Brazilian Mercantile and Futures Exchange (BM&F), creating the world's second largest stock exchange. As a result of an early 2008 stock swap, Chicago's CME Group owns a 5% stake in BM&FBovespa, and in turn, BM&FBovespa owns a 5% stake in CME Group. The agreement has also created an order routing trading system between both exchanges. On June 18, 2012, BM&FBovespa became a founding member of the United Nations Sustainable Stock Exchanges initiative on the eve of the United Nations Conference on Sustainable Development (Rio+20). The exchange has a pre-market session from 09:45am to 10:00am, a normal trading session from 10:00am to 5:30pm and a post-market session from 6:00pm to 7:30pm weekdays and holidays declared by the Exchange in advance. 11 and onward, codes may represent many situations, most commonly units (UNT, a certificate meshing different equities together. For instance, SULA11 is a unit comprising one common stock and two preferred stocks issued by Sul América S.A.), exchange-traded funds, real estate investment funds (known as FII, REIT in English) and Brazilian Depositary Receipts (BDRs). Nevertheless, they may state other conditions, as debenture subscription rights, special situations, and so on. It is important to note that "classified" preferred stocks (A, B, C, D and furthermore) do not have an implicit meaning, i.e., each issuer may attribute different rights and restrictions for a given class. This means it is mandatory to learn individually their characteristics as they are not directly comparable among companies. The suffix B after the ticker means the equity is traded at the over the counter (OTC) market. Equities' trade names are composed by the issuer's name, brand name or abbreviation (as it is limited to 12 characters), equity type, corporate governance level when pertinent and ex rights indication when appropriate. SMLL: The Small Cap Index comprises relevant companies who don't apply for the MLCX listing, i.e., heavily traded companies which does not fill the 85% market share criteria. IVBX: It was conceived as an index to trail the 2nd tier companies, defined as those which trading ranking is from 11th and beneath, therefore not to be classified as blue chips. Nevertheless, most of its members are highly relevant companies, needing to comply with high traded volume and market capitalization. IFNC: Financial Index (comprising banks, credit card processors, insurance companies, etc.). IMAT: Basic Materials Index (representing raw materials, pulp & paper, packaging, steel, etc.). UTIL: Public Utilities Index (electric power, water & sewage, gas, etc.). IGC: Corporate Governance Index comprises all companies listed in any of the distinctive governance levels, irrespectively of its market cap. IGCT: Corporate Governance Trade index filters the IGC components by trading liquidity. IGNM: The New Market Index congregates all listed companies in the New Market portion of the BOVESPA. ITAG: The Tag Along Index is composed of equities that offer to his bearer privileged tag along rights compared to those granted by Brazilian law and a minimum trading volume. ICO2: Efficient Carbon Index is granted to companies who complies with efficient efforts to control greenhouse gas emissions and are eligible for IBRX 50. ISE: Corporate Sustaintability Index is comparable to the Dow Jones Sustainability Index, to join companies tied to environmental, social and accountability goals. IFIX: Real State Investment Funds measure the listed REIT's return at BOVESPA. Unlike other indexes, it can be composed of OTC equities. BDRX: Unsponsored Brazilian Depositary Receipt Index reflects the valuation of those equities which are not freely distributed at the stock exchange but limited to qualified investors, as defined by Brazilian regulations. ↑ Patrícia Duarte (17 August 2011). "Ibovespa sobe 1,38%; giro da bolsa bate recorde". Exame. Retrieved 5 May 2016. ↑ "Banco Santander's Brazil Unit Raises $8 Billion in I.P.O.". International Herald Tribune. 8 October 2009. Retrieved 5 May 2016 – via The New York Times. ↑ "CME Group, BM&FBOVESPA Announce February 9 Start Date for Order Routing CME Group Products on BM&FBOVESPA's GTS Platform - Feb 06, 2009". Retrieved 5 May 2016. ↑ "Sustainable Stock Exchanges Initiative: Exchanges listing over 4,600 companies commit to promoting sustainability". 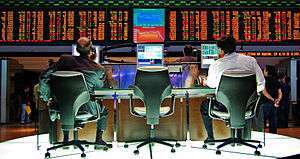 Sustainable Stock Exchanges initiative. Reuters. Retrieved 13 May 2014.